[Image: Photo by Ko Sasaki, courtesy of the New York Times]. 1) "This webpage contains earthquake 'sounds' created from seismic recordings around the world generated by the 2011/03/11 Mw9.0 Tohoku, Japan earthquake. They provide a unique way for us to listen to the vibration of the Earth that is otherwise inaudible to us, and to decipher the complicated earthquake physics and triggering processes." 2) "The stone tablet has stood on this forested hillside since before they were born, but the villagers have faithfully obeyed the stark warning carved on its weathered face: 'Do not build your homes below this point!' Residents say this injunction from their ancestors kept their tiny village of 11 households safely out of reach of the deadly tsunami last month that wiped out hundreds of miles of Japanese coast and rose to record heights near here. The waves stopped just 300 feet below the stone... 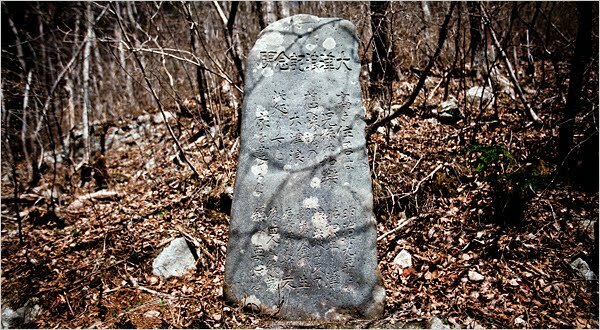 Hundreds of so-called tsunami stones, some more than six centuries old, dot the coast of Japan, silent testimony to the past destruction that these lethal waves have frequented upon this earthquake-prone nation." 3) "Europe may be starting to dive under Africa, creating a new subduction zone and potentially increasing the earthquake risk in the western Mediterranean Sea... For millions of years the African plate, which contains part of the Mediterranean seabed, has been moving northward toward the Eurasian Plate at a rate of about an inch every 2.5 years (a centimeter a year). Now studies of recent earthquakes in the region indicate that a new subduction zone may be forming where the plates are colliding along the coasts of Algeria and northern Sicily... [M]ost established subduction zones are marked by giant undersea trenches. A similar trench should eventually form in the Mediterranean—but certainly not overnight."